When Eliza Barnes said 'I do' to her husband all those years ago, she thought that they'd be together forever. Instead, he's flown to Abu Dhabi to start a new life, and she's returning to the little seaside town of Lavender Bay. It's finally time to chase the dreams she's put on hold for so long, whipping up luxury bath products and organic soaps using local ingredients. Of course, she didn't expect to meet local farmer, Jack Gilbert, or for him to be quite so gorgeous! 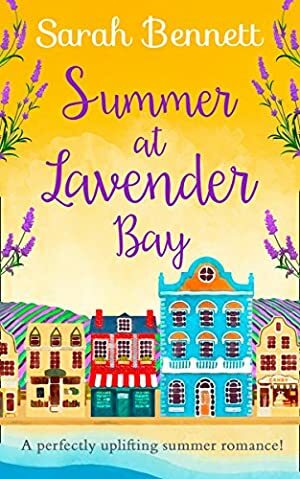 "Summer At Lavender Bay by Sarah Bennett is a deliciously warm, welcoming, fun contemporary read and just perfect for a summer's day." "Absolutely loved this book it has a great story line and the characters feel like great friends who you laugh with and cry with and really care about." "Such a joy to read - I cannot recommend this book enough!" "Sarah Bennett always keeps me entertained from the very first page"
"This is a brilliant five star modern fiction story." Log In to track Sarah Bennett on eReaderIQ. to be notified each time the price drops on any book by Sarah Bennett. to stop tracking Sarah Bennett. We started tracking this book on April 26, 2018. The price of this book has changed 9 times in the past 358 days. The current price of this book is £2.49 last checked one hour ago. This lowest price this book has been offered at in the past 90 days is £1.49. The lowest price to date was £0.99 last reached on August 11, 2018. The highest price to date was £2.99 last reached on April 26, 2018. We last verified the price of this book about one hour ago. At that time, the price was £2.49. This price is subject to change. The price displayed on the Amazon.co.uk website at the time of purchase is the price you will pay for this book. Please confirm the price before making any purchases.